Kaaron has been publishing short stories for nearly 20 years — ‘All You Can Do is Breathe’, by the way, is on the ballot for this year’s Stoker Awards — and has recently published three novels with Angry Robot Books. What makes Kaaron’s writing so engaging (and such a joy to read) is that it is so twisted, strange, inventive, and utterly unique. She comes at stories from wonderful, unusual angles — as she has this week’s writing advice. It struck me last night that writing a story is a bit like filling in a Sudoku puzzle. You start with a grid, dotted with things you know. Maybe a spark of an idea, a setting, a snippet of conversation. The rest of the grid is blank. Daunting. Some spaces you see straight away how to fill, but others? They seem impossible. Some of the blanks are easily filled; who’s telling the story? Why? And you can describe your scene, build your character. Once you’ve done that, the spaces that seemed difficult become easier. The story starts to fall into place until you’re left with only one or two of those impossible-seeming spaces, with the answers now obvious, and you know how your story ends and how you’re going to get there. 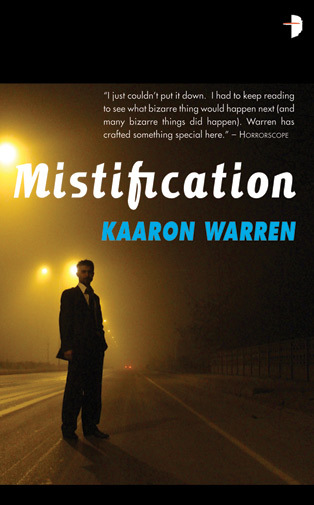 Kaaron Warren has won or been nominated for the Stoker Awards, the Australian Shadows Awards, the Aurealis Awards and the Ditmar Awards for her incredible short story collections (Dead Sea Fruit, The Grinding House and The Glass Woman) and her wonderfully creepy novels (Slights, Walking the Tree and Mistification). You can find her online here. Tags: aurealis awards, dead sea fruit, ditmar awards, Kaaron Warren, mistification, slights, stoker awards, the glass woman, the grinding house, walking the tree, writing advice. Bookmark the permalink.